humans who were deeply in love. This legend features two star-crossed lovers, the young brave warrior Popocatépetl and the beautiful princess Iztaccíhuatl. The father of Iztaccíhuatl, a mighty ruler, placed a demanding condition upon Popocatépetl before he could take Iztaccíhuatl as his bride. His mandate required that Popocatépetl first engage in battle against the tribe’s enemy and return victorious. Variations of the legend include the added stipulation that Popocatépetl needed to return with the vanquished enemy’s head as proof of his success. The Gods, touched by the lover’s plight, turn the humans into mountains, so that they may finally be together. 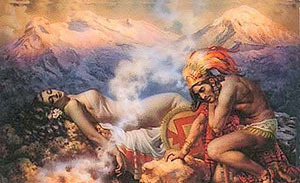 They remain so to this day with Popocatépetl, (the smoking mountain) residing over his princess Iztaccíhuatl, (the sleeping woman) while she lay asleep. On occasion, Popo will spew ash, reminding those watching that he is always in attendance, that he will never leave the side of his beloved Izta. 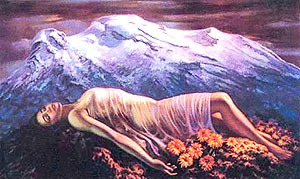 He carries Iztaccíhuatl’s body to the mountains whereupon he has a funeral pyre built for both himself and his princess. Grief-stricken beyond measure, Popocatépetl dies next to his beloved. Great post! I want to see a follow up on this topic!! !